R Baker (Electrical) Ltd offers a comprehensive maintenance and repair service for all your pumps. We also hold a large stock of pumps which offer our customers a quick turnaround when required. All our quality standards and procedures are monitored independently to BS EN ISO 9001:2000 and are subject to regular external and internal audits. We also work with all the leading testing and quality authorities such as BSI, DNV, Lloyds, NSN, Nemko and VDE to give you total peace of mind. Our pump and motor rewind team are available 7 days a week; providing you with a peace of mind that we are ready for critical breakdown situations. We plan and run maintenance programmes with a wide range of national businesses, and over the years we have developed and improved our motor department to deal with all imaginable customer needs. 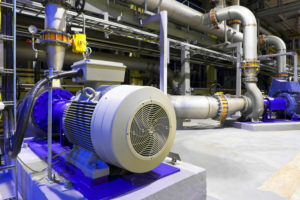 We repair and supply a large range of pumps to the rail, nuclear, universities and chemical industries, all of which require a unique service. With our highly skilled technical team, we have the ability to meet these requirements by supporting your management team. Whether it is to start a maintenance strategy from scratch or to assist in solving a persistent problem with a particular piece of equipment, our engineers are experienced in providing solutions for a wide variety of businesses and plant types. When combined with our other repair and maintenance services, this allows us to provide you with a complete solution from planning right through to execution, with all the facilities provided in-house. Our client requires us to attend their campus to collect motors ranging from 0.357 Kw up to 100Kw. Our team carry out a full inspection and report. 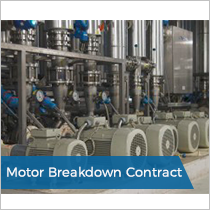 This allows our engineering team to repair or supply a new motor of the specific brand, such as Brook Crompton, VEM or WEG. All repairs are carried out at our repair shop based in Speke, Liverpool, within 24-48 hours. We offer a full motor rewind service including the servicing of pumps, gearboxes and stator rewinds. 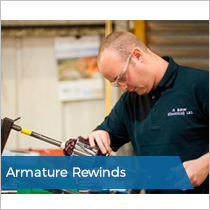 Our team have been working with Unipart Rail for over 25 years, rewinding and overhauling a range of armatures and field systems. The relationship has been built on us being proactive to all motor and armature rewinds, offering a 48-72 hour repair service.